Szym-nutriRE is a type of complex feed enzymes designed and formulated by our animal’s nutritionists and microbiologists for the regular daily diet feed according to the different kinds and contents of anti-nutritional factors in the materials of feedstuff and the physiological characteristics of animals in different ages. The product has been applied to many animals and has obtained excellent effects through numerous feeding experiments and applications. Cellulase: 1 unit of acid cellulase equals to the amount of enzyme which hydrolyze CMC-Na to get 1μmol of reducing sugar (in glucose) in 1min. at 50℃ and pH 4.8. --Mananase: 1 unit (u) of mannase is defined as the amount of enzyme which liberates 1μmole reducing sugar per minute from 3mg/mL mannan at 37.0°C and at pH 5.5 under the condition of the test. --Reduce the nitrogen and phosphor contents in animals and also the environmental pollution, at the same time to improve the feeding environment. In the regular daily diet of feedstuff, there are some anti-nutritional factors except for a great deal of nutrition which is necessary for animals. These anti-nutritional factors resist the nutrition wrapped in the feedstuff to be digested by the simple-stomach animal, thus to cause the animal’s indigestion, thick dropping, hypogenesis, etc. 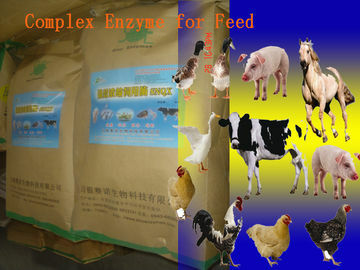 If we add complex enzymes such as β-glucanase, xylanase, cellulase into the feedstuff, the complex enzymes could break down anti-nutritional factors so as to release the nutrient, reduce the viscosity of chyme, make the nutrient fully absorbed, decrease the bacterial substrate in the ileum, control the reproduction of the harmful animalcule, and prevent diarrhea. As for the poultry with poor endogenous enzymes,adding exogenous enzymes could make the nutrient fully absorbed. 15/20/25kgs/bag. Or package as per requirement.